1 6 oz. Fillet of swai or other light, white fish. Bring a small pot of salted water to the boil. Add the potato, unskinned, and boil on a med/low heat for 20 minutes or until tender. If the skin breaks, it is probably a little overcooked, but don’t worry it’s still edible. While the potato is cooking, pre heat the oven to 375F, put 1 inch of water in another small pot , add salt, bring to the boil and add the peas. Cook for 2 minutes then drain. Add 1 tbsp butter, a Pinch of salt, a light touch of garlic powder and pepper, mix together. Set aside to keep warm. Sprinkle the fish with the white wine and set aside. Melt 2 tbsp of butter and pour evenly over the fish. Now season the fish with the lemon pepper, paprika and parsley. Place the fish on an oiled or non stick baking pan and in the centre of the oven. Bake for 10 to 15 minutes or until fish flakes. When the potato is done, drain, slice open, add butter, salt, pepper and garlic to taste. Set aside. 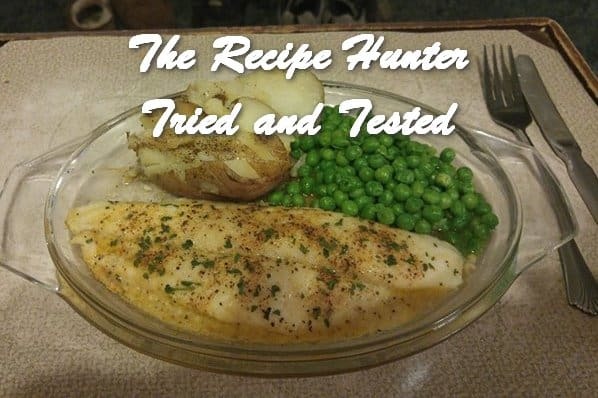 When fish is done, add peas and potato, spoon drippings from fish over the fish and if all is warm, serve immediately, otherwise touch up in the microwave. This took me about 30 minutes all in all. Increase quantities accordingly as needed.